Cape Girardeau Therapist: Shannon Anderson - Therapist 63703. 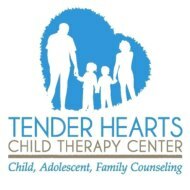 Tender Hearts Child Therapy Center is a counseling private practice with offices in Cape Girardeau, Missouri specializing in Child, Adolescent, & Family Counseling. How Do We Help Children, Adolescents, & Families? You’re probably wondering how counseling with a child, adolescent, and family specialist can help your child or family. At Tender Hearts, your family’s care and treatment needs are our #1 concern. Our Counselors use Evidence-Based Treatments whenever possible to be sure your child and family get the most immediate, longest lasting results possible. As a client, you will also enjoy convenient after school and weekend appointments in most cases. And if you have Health Insurance, we are In-Network Providers with most plans! What Results Should Your Child & Family See From Counseling With One Of Our Specialists? Many of our past clients report improved family relationships and communication skills, decreased disrespectful and defiant child behaviors, significantly reduced anxiety or depression symptoms, and much more. No matter what challenge your child or family is struggling with, let one of our trained child, adolescent, and family specialists guide you and your child or teen down the path to a brighter future today!